Ambrose Keeble a member of the White Ghost Band of Huηkpati Dacotah is originally from the Crow Creek Reservation in South Dakota. He says he inherited his gift of art from his grandfather. His grandfather worked in all mediums creating and painting drums, dance shields and painting hides. Keeble feels his artwork keeps with tradition. The name White Ghost belonged to a son of a respected Huηkpati Dacotah chief who separated from the rest of the Huηkpati's while trying to out run the US Calvary who were ordered to round up Chief Bone Necklace and his band. Chief Bone Necklace was captured by the U.S. Calvary along the east side of the Missouri River. Through treaty negations Chief Bone Necklace and his band were relocated to the Crow Creek Reservation. When Chief Bone Necklace passed away his son, White Ghost took over as the leader of the Huηkpati Dacotah tribe. White Ghost was one of the last recognized chiefs of Keeble’s family’s history. Keeble uses many traditional and sacred symbols in his artwork, particularly the eagle, eagle feather and turtle. To the Sioux, the turtle represents long life. The eagle is venerated for many reasons. To Keeble, the eagle deserves such strong respect because it is the only animal believed to talk directly to the Creator. For this reason, every eagle feather is blessed. While he paints, Keeble enjoys the sounds of traditional wacipi - powwow - music. This is reflected in many of his designs. He often paints symbols swirling in opposite directions, which represents the traditional dance where the men move along the outside in a counter-clockwise circle and the women move clockwise on the inside. Another prominent design in Keeble’s work is the Eagle Feather design as he calls it. The design is often referred to as the warbonnet or sunbirds design as well. 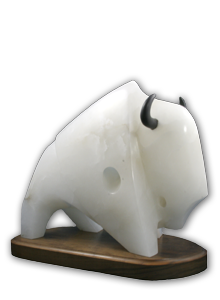 Today, Keeble resides in Denver Colorado and specializes in painting buffalo hides. When a hide becomes available, Keeble prepares and tans the hide himself. Then, he begins work on designs for painting the hide. Normally, the process takes him approximately a month and a half for one finished hide.